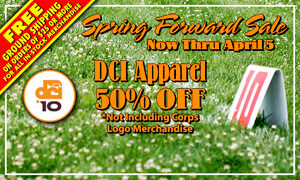 Step into spring with Drum Corps International's blowout on all DCI logo apparel. Only through April 5, we're offering deep discounts that'll save you 50 percent on original prices. As an added bonus, all orders of $25 or more will receive free ground shipping*! Take this opportunity to stock your wardrobe for the 2010 DCI Tour with outerwear from $12, T-shirts from $9, hats from $8, Under Armour polos from $22, and much more! *Free shipping is limited to standard delivery within the Continental U.S. excluding APO/FPO addresses. Applies to in-stock merchandise only.